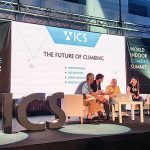 As the climbing gym universe begins to coalesce we’re seeing large, multi-site operators begin to build their empires and spread their brands further afield. 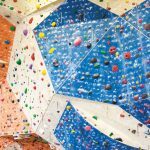 One such company is New Jersey-based Gravity Vault, which currently operates three traditional climbing gyms in and around the New York City area. 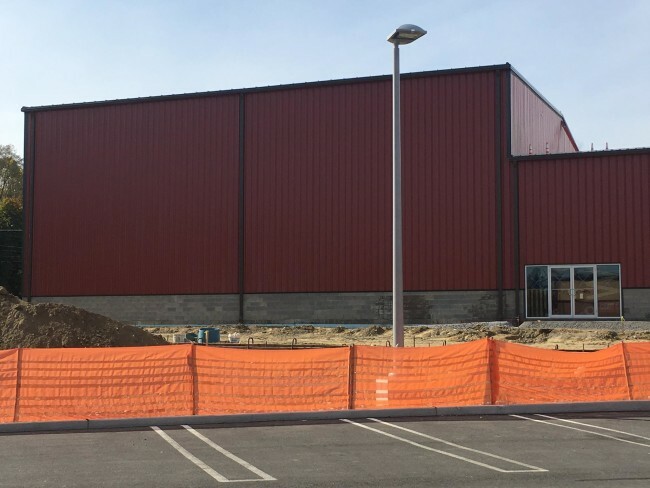 Earlier this month Gravity Vault made a bold announcement that they will be opening four new climbing gyms in 2016. If Gravity Vault can pull it off, it will be the largest number of gyms opened in a single year by a single company. In fact, no US climbing gym operator has opened more than two gyms in a calendar year. GV last opened a facility in Middletown, New Jersey back in 2014. 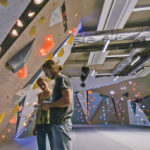 That facility was the first ever franchised climbing gym in the US and something the owners of Gravity Vault, Tim Walsh and Lucas Kovalcik, had been trying to do since opening their first location in 2005. To begin their epic year, the partners will open up a new facility in Poughkeepsie, New York which sits on the banks of the Hudson River, two hours north of New York City. The town of Poughkeepsie only has a population of 30,000 people, but the county it lies in, Dutchess County, has nearly 300,000 people. The Gravity Vault facility will be the first commercial climbing gym in the area. Even though this location will be the second franchise for Walsh and Kovalcik, franchisee and Poughkeepsie owner, Mark Davidson, hopes to bring a few changes to the way Gravity Vault does business. Another modern upgrade will be the way routesetting is done. Davidson is keeping up with the modern trend of monochromatic setting. That is, using the color of the hold to dictate the route line and not a piece of colored tape. “We have 10 different colors of climbing holds. Each color will signify a climbing grade level or range of grades. This is just like taping each hold with colored tape except we use the hold color itself, so the walls are much cleaner and routes easier to follow,” Davidson explained to Peak Magazine. One thing Davidson is not changing is the amount of climbing. All of the GV locations are under 14,000 square feet of climbing (SFC). The Poughkeepsie location will feature 13,000 SFC. Features include: a three-inch crack, a one-and-a-half-inch crack, a chimney and a 22 foot lead arch. All in all, there will be 70 top-rope lines, 15 lead only routes and nearly 100 linear feet of bouldering wall. The Poughkeepsie building under construction. Walsh and Kovalcik told CBJ that in the second quarter of 2016 they hope to open a facility in Melville, New York, which will not be a franchise, but instead will be corporately owned. Melville is a suburb of the Town of Huntington, which sits in the middle of Long Island an hour and a half from New York City. Long Island, and especially Huntington, is a very attractive place for gym operators. 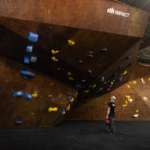 In fact two other major gym developers, The Cliffs and Brooklyn Boulders, have recently opened facilities in the area. Melville sits at the intersection of two of the busiest roads in the New York area, in an area with some of the highest family median income at $170,881. In June GV passed their first round of zoning challenges with the approval of a Special Use Permit. Their next stop will be an appearance in front of the Huntington planning board. Also happening later this year will be GV’s entry into the potentially lucrative Philadelphia market. 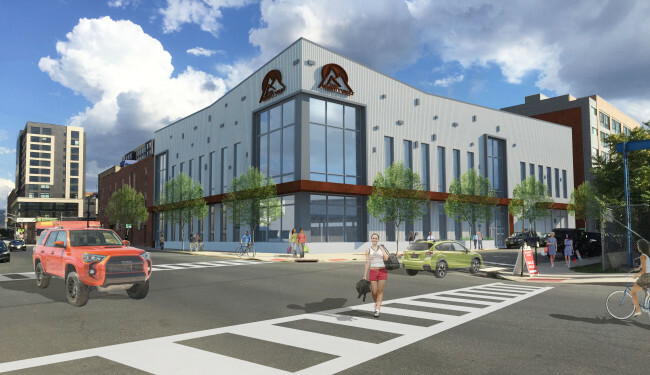 This new gym will be located in Radnor Township, just outside Philly and between two other commercial climbing gyms, both of which are operated by Philadelphia Rock Gym. (Philly Rock Gym is also opening a new facility in 2016, twenty miles from the new Gravity Vault). The Radnor gym will be a franchisee operated facility, making it GV’s third franchise license. Building rendering for the new Gravity Vault – Hoboken. Rounding out the year for Gravity Vault will be a new location in Hoboken, New Jersey. Hoboken is directly across the Hudson River from Manhattan and has the fourth highest population density in the US. Even though the gym could be accessed by millions of potential customers, the road to opening the doors has not been a slam dunk. “The Hoboken market is something that we’ve been after since 2007,” Walsh said. The two partners grew up in Bergen County, where Hoboken sits, and particularly like the changing demographics of the area. In a town that’s only a square mile the major challenges for GV center around the acquisition of a suitable building. 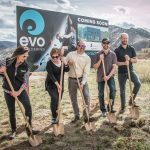 In 2014 GV was courted to be part of a $110 million dollar multi-use redevelopment project that included a bowling alley, a bar, restaurant as well as a live-performance venue. There were also plans for a 12 story residential structure in the middle. Even though this project met all the proposed goals of the Mayor, the city’s master plan, and what the City Council has outlined in recent months, it was denied a zoning variance and the project was mothballed. Then a year later the GV team partnered with a different development firm and found a suitable building a few blocks down the street at Willow and 15th Streets. They had yet another trip to city hall to go in front of the Hoboken zoning board to get approval for their zoning variance. On November 30th of last year, Gravity Vault was given the OK to move ahead with remodeling the vacant single-story warehouse. Walsh and Kovalcik hope to have their Hoboken facility open by the end of the year. With this kind of development, Gravity Vault is becoming a major player in the North East climbing gym market. When they open these four new gyms GV could become the 6th largest gym operator in the US based on square feet of climbing (the total amount of climbing is still unknown), and would be tied for second place (with Hangar 18) for number of facilities in operation. More and more that interest is coming from serious global developers. The pair have received calls and met with a number of groups interested in bringing an established climbing brand to their country. Though they wouldn’t be specific about where, they did say the interest is coming from Asia, Europe and the Middle East. “We just financially qualified a group from Asia…these guys are big time. They’re not looking to build a single location, they’re looking to do multiple locations,” Kovalcik said. Recently at the International Franchise Expo in New York City, the partners made contact with several interested parties, two of which came from different countries specifically to experience and learn more about the Gravity Vault brand. “They weren’t there for anything else,” Walsh said. To help with international expansion, the GV team includes a franchise advisory group that has experience in all aspects of business including taking a brand overseas. This group is helping GV to create an international package for prospective applicants.